The four-in-hand tie gets its name from the method most typically used to tie it: the four-in-hand knot. James Bond more often than not uses this knot. Sean Connery uses it in his Bond films from From Russia With Love to You Only Live Twice. Roger Moore, Timothy Dalton and Pierce Brosnan always use it in their Bond films. Daniel Craig ties a four-in-hand knot in Casino Royale and Skyfall. The four-in-hand knot is characterised by its long, asymmetrical shape. The asymmetrical shape skews the tie over to the side, adding either a touch of character or a bit of imperfection, depending on your taste. The four-in-hand knot is the smallest of the more typical tie knots, but its size varies considerably depending on both the width and thickness of the tie. A heavier tie will produce a wider knot, whilst a wider tie will produce a longer knot. Pierce Brosnan most likely wearing his tie in a double-four-in-hand knot. For an even larger four-in-hand knot there is the variation called the double-four-in-hand knot—also known as the Prince Albert knot or Victoria knot—which takes the four-in-hand knot and adds an extra wrap of the wide blade around the narrow blade. It’s asymmetrical like the four-in-hand but has the major advantage of being a more secure knot. It’s also more askew than the regular four-in-hand, which some people may find unappealing. Roger Moore and Pierce Brosnan likely use the double-four-in-hand knot at least occasionally. 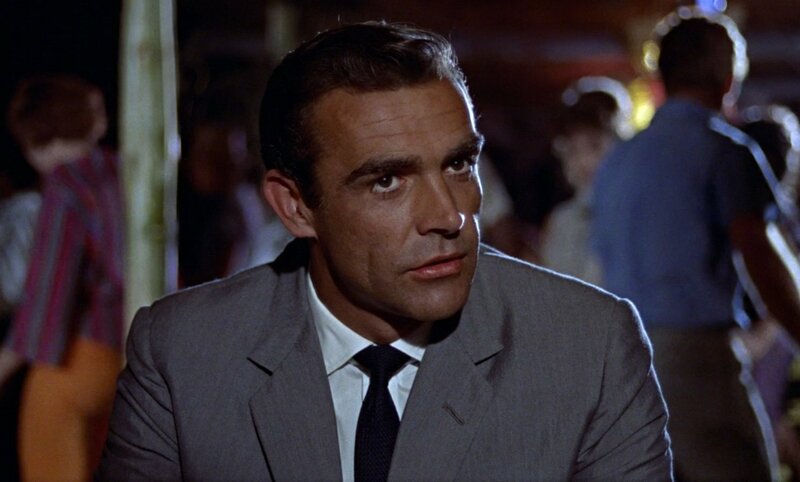 Though Ian Fleming’s Bond was not fond of the Windsor knot, Sean Connery wears it in Dr. No—where it goes well with the cutaway collars—and Diamonds Are Forever, as well as in the unofficial Bond film Never Say Never Again. The Windsor knot is a larger knot designed to mimic the thicker four-in-hand knots worn by the Duke of Windsor. It has a wide, symmetrical appearance, and on a wider tie the knot can end up very large. George Lazenby also uses a symmetrical knot on his ties, most of which are most likely tied in the smaller Half Windsor knot. His wedding tie, however, is tied in a true Windsor knot. Many find the bulbous Windsor knot—especially when tied with a wide, thick tie—vulgar, and they find that the symmetrical shape lacks the character of the asymmetrical four-in-hand. Which knot do you prefer to use? There’s one mystery knot in the Bond series: the knot Daniel Craig uses in Quantum of Solace. It’s symmetrical and just slightly elongated, which would suggest that it’s a Pratt knot. However, a half-Windsor or a Windsor knot with a lighter-weight tie can make this type of knot. When Craig removes his tie before interrogating Mr. White, the tie has the seam facing the neck. That rules out the Pratt knot, which starts with the tie’s seam facing out. Which knot do you think is used in Quantum of Solace? It is most likely a Windsor knot. Windsor knots are typically very wide, but they don’t have to be wide if the tie has a thin interlining, and that would be the case here. A tie knot’s shape comes not only from the knot itself but from the weight of the tie’s silk, the weight of the tie’s interlining and the width of the tie. A thicker silk with a thicker interlining will make for a wider knot, while a wider tie will make for a longer knot. In my opinion the Windsor knot is only vulgar if one is dealing with a wide, garish 1970’s style tie, otherwise there is nothing wrong with it, and it can add a bit of heft to a lightweight tie. Hatred for the Windsor knot seems to be one of those “memes’ that spread over the Internet. I find the four-in-hand knot in the first picture from FRWL a bit anemic, and also fail to see the charm of a skewed, imperfect knot. Then again, I am that unusual Italian who doesn’t go for sprezzatura. For what it’s worth, I always liked the “heft” of Roger Moore’s tie knots, as well as the way his ties “popped” from under the shirt collar. I agree that on ties from the ’60s, the four in hand can look rather undersized. There’s no real “hatred” for the Windsor (except the baseball sized knots worn by sportscasters and other guys who are using way too much of the wide part) so much as a preference to not use it. It’s also the fact that most well-dressed men of the last century used the four in hand exclusively. I disagree. I think the Windsor can look very elegant and powerful at the same time. Just take a look at Mads Mikkelsen’s costumes from Hannibal. I agree 100%! The windsor knot is very elegant. It’s my favorite knot to tie. In fact the show Hannibal is the reason I tie windsor knots only problem is I can never get my windsor knots to be as large as his. Do you know how ties his large windsor knots? A wider tie makes the knot longer whilst a thicker tie makes the knot wider. I would highly advise against tying a Windsor knot as large as Mads Mikkelsen in Hannibal. Something more like Sean Connery’s knots in Diamonds Are Forever is a good example of a windsor knot. 90% sure that Hannibal is using a Balthus knot, not a Windsor. It would seem to fit the character too: French, obscure, and yet enormous. One downside to the knot- you need a VERY big tie. Otherwise you end up looking like a clown when you open your jacket. Or maybe a half Windsor? I’d guess that the QoS tie is a half-Windsor but agree it isn’t entirely clear. A half-Windsor with an extra wrap of tie around the knot (if you have a long tie that isn’t too thick) can provide a bit of extra length to the knot and reduce something of a the half-Windsor’s distinctive shape but I don’t think that’s what they’ve done here. Personally, I don’t like the Windsor knot but do wear a half-Windsor a fair bit. The correct knot for a tie seems to depend on the tie you are wearing and the collar you’ve got on, to me. That said, the full Windsor is just a bit too much. Ian Fleming’s observations on the world were often half baked and wrong (homosexuals can’t whistle and sumo wrestlers can retract their testicles are famous examples) but here he was about right. That might be because it is a look we tend to associate with footballers, however, rather than Windsor tie wearers such as Fred Astair or Patrick McNee. I am 5’7″ and have a 14.5″ neck, therefore some of my ties require a full windsor in order for me to wear them (they’re too long otherwise). That said, it’s always my last choice when a four-in-hand, Prince Albert, or half-windsor just won’t due. I’m about your height and recently I’ve recently bought ties on eBay that are about 55″ long (shorter than the typical 57″) just so I can use knots other than the full Windsor. The nice thing about eBay is you can specifically search for ties that are shorter lengths and I’ve found some nice brand new ties, costing much less than what they would have been in a store. I don’t think there’s a knot better than others. It all depends of the style of the collar shirt, tie and jacket lapels you’re wearing. The very thin four in hand knot Connery wore in the 60s goes well with his narrow tie and narrow jacket lapels. The tie knot has also to match the kind of face of the wearer. A double four in hand, with his elongated shape, suits Brosnan’s (rather) long face very well, as well as the mysterious and rather big knot Craig wears in QOS suits his face and his tall and large spread collar. As far as I am concerned, I like four in hand and half Windsor knots, and I think that the size and thickness of the tie -and thus the kind of knot- should be determined by the height, spread and collar space of the collar. But with today’s often too long ties, if one likes to wear natural waist trousers and doesn’t have the chance of using made-to-measure ties, it’s already very difficult to find the perfect length, so the tie knot is often used as a simple variable to allow the tie to drape and stay at the good position, around the trousers’ waistband. I’ve used Tiecrafters in New York to shorten my ties. Apart from that, I find that tucking the narrow blade into my trousers is preferable to tying a larger knot. Whilst a larger knot requires a wider and taller collar, a wider collar doesn’t necessarily need to be filled with a larger knot, as Connery shows. Agreed. Even at 6’1, I find some modern ties far too long. With knit ties I see little problem in just tucking the whole thing in, since they have a square end anyway. I always make sure my tie blade is out of sight when wearing a three piece suit. A lot of posts lead back to this pertinent question; why do modern manufacturers of men’s ties produce them with this excessive length which results (especially given the current higher button positioning coupled with a lower trouser rise) in the display of a tie blade in the position between trouser and jacket? Even allowing for the obvious decrease in good aesthetic taste in recent years, I’m sure most people of reasonable taste can see than tie visible as far as the top button of the jacket (the normal state of affairs until the last decade or so) and no lower looks far preferable to the eye than the alternative. So, the question remains; why would businesses wishing to maximise profit waste precious silk to no practical purpose? All the wasted silk would obviously produce a greater amount of ties and more profit. As far as I can see ties have gotten progressively longer over the years and it’s utterly unnecessary. Even someone like me who wears suits and jackets with a lower button stance than is currently fashionable can still find some tie blade showing. Ditto, LeChiffre. And, like another Mark has said, it’s very difficult to create and keep a neat dimple such as that on Craig’s QoS tie. It would be grand if tie-makers could settle on a happy medium between no lining and its stress on the silk fibres, and thick lining, which can result in awkward knots. Until then, I alternate between 4-in-hand and half-Windsor. Instead of a tie bar, I have a gold chain looping the tie and hooking onto a shirt button. In what movies/scenes did Brosnan use the double-four-in-hand knot? The knot pictured from The World Is Not Enough looks to me like a double-four-in-hand (I use them often myself), but it’s impossible to tell for sure. What are the visual clues to look for? I’m a fan of the four-in-hand myself but the possibility of a more secure knot is appealing. One problem I sometimes encounter with the double-four-in-hand is that the knot can crease at the side, and that’s something I see here. Sometimes the knot can look more tubular, whilst the four-in-hand knot will look more triangular. I have an issue with tying my ties that I was looking for help with. I generally wear quite slim ties, normally 2.5 to 3 inches, and I often find the blade of the tie coming off centre from the knot, which gives an unsightly peek of the back blade under the knot and messes with my dimple. I wear a double four in hand (I’d prefer a single but I can’t afford MTM ties so they’re all slightly too long). Any help would be appreciated, thanks. Also, I love the blog Matt. Over the past few months it’s turned this humble British 16 year old from a slob in jeans and ill fitting t-shirts to a men’s fashion enthusiast, I base most of my wardrobe these days on James Bond. My friends all think it’s quite sad how much it angers me when they button both buttons on their suits. Cheers! Good question, Mark. I hope someone can help. I often have the same issue and am forced to keep pulling the front blade to the right all day. I also have a slight problem with some of the tie showing above the top fold, and I’ve yet to prefect the dimple. It’s more luck with me. For better or worse, I don’t live in a climate where I can wear suits and ties often, and I’m not among much company that cares. 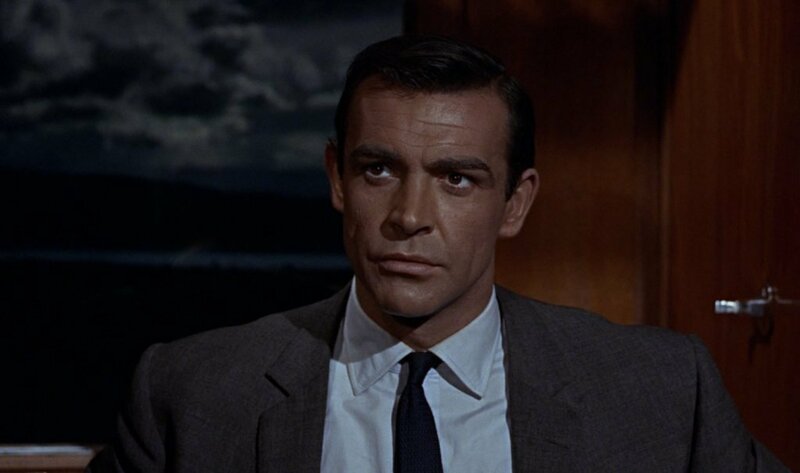 I’m 30 now, and American, but I was influenced by Bond’s fashions when I was your age too, or a bit younger. Since you like the slim ties, you might also want to take some pointers from Matt Bomer’s character on the USA Network’s TV show, “White Collar”. A lot of it may be too flamboyant, but I’ve adopted some of his style – including the tie bar and the slim-fitting jackets. i saw a video of someone tying a “double four in hand.” i know that knot by the name victoria knot. if the victoria knot’s not working out for you, i’d suggest a half windsor — it’s the same knot size, but you have an additional center pass which means it should hold tighter (and be a tad broader) than the victoria knot. all that i said before about the pratt and nicky knots still applies; however, the pratt and nicky knots are actually a tad bit smaller of a knot than the victoria knot. as with the pratt and nicky knots, the half windsor is also a symmetrical knot. The double-four-in-hand knot is nice because it’s asymmetrical, yet it holds much tighter than a regular four-in-hand. Some also call it the Prince Albert knot. I suspect that the QoS knot may be a Half-Windsor, since I usually use it to tie my ties, with results that look very similar Craig’s knot. But I guess it’s impossible to know for sure unless someone sneaks into his dressing room to watch him tie his tie. I know the four-in-hand is preferred by most men, but I personally am not a fan of the asymmetrical shape. I love the medium-sized symmetrical triangle that I can make with a Half-Windsor knot. The only time I tie a FIH is when I wear my knit tie, since I’ve found that using a HW with that material creates an overwhelming sportscaster knot. 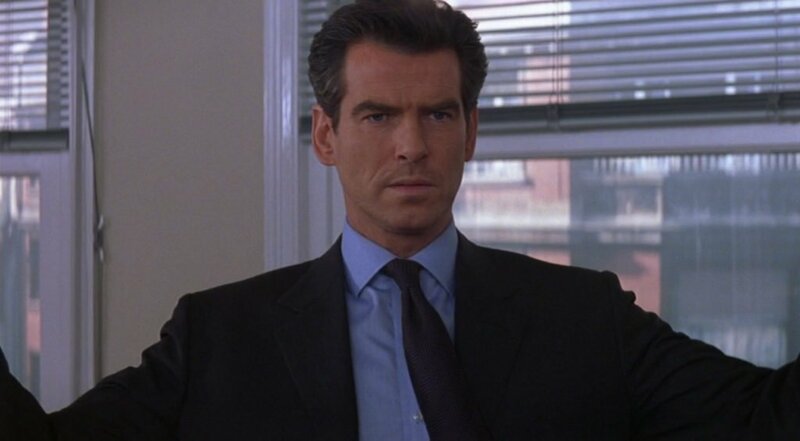 How about this tie knot Brosnan wears in DAD? 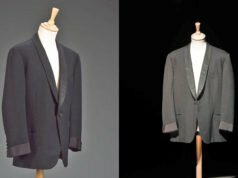 https://www.bondsuits.com/?p=78 It can be better seen in the second photo, I’d say it’s a half windsor. I just love that tie and the way it ties that knot. Even though it’s a wide knot, it’s asymmetrical so it can’t be a half-Windsor. Turnbull & Asser may have made Brosnan’s ties heavier so they would have a fuller knot to go with the wider Brioni collars. Another great post, Matt. I prefer a four-in-hand, or double four-in-hand. And while I don’t have a problem with a small half-windsor, I never tie one. And a windsor is a no-go for my style. Symmetrical and one asymmetric. I believe Craig is wearing the latter. The half-Windsor is a symmetrical knot. 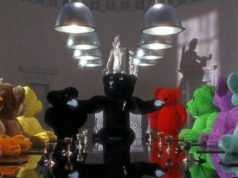 Craig’s knot in Quantum of Solace is symmetrical, and you can see that by the way the tie hangs straight down the middle. I see. I tie a half Windsor. However I was once told that the half Windsor was exactly half of a full Windsor ie one side vertical and the other with a wide angle. Similar to how a four-in-hand would loo and tied the same way one would start a Windsor but only building one side before wrapping around. Apologies for any confusion. What is this knot known as? Yes, this is exactly what I thought. That’s why I thought that reddish ties Brosnan wears in DAD while leaving the Hong Kong hotel was tied with a half windsor knot. The half windsor knot I tie is asymmetrical. Sometimes half-Windsor knots can come out slightly askew, depending on how the tie is tapered, but they are supposed to be mostly symmetrical. Any ideas on the name of the knot that I’m trying to describe here? The only of the more common truly asymmetrical knots are the four-in-hand and double-four-in-hand, if you’re starting the tie with the seam down. I wear all my ties with the full Windsor knot and I have done so my entire life although I have tried another knots as well. I like the symmetrical look and the dimple that you can create with it looks great when tied properly. I will say the knot looks better when worn by a man with a more constructed face and not so much of a rounded face but that is just my opinion. The 4 in a hand does look well with slimmer suits and skinny ties to but the full Windsor should never be hated. I agree. The first knot I ever wore was the full Windsor, I was quite proud when I finally mastered the art of tying it. I think the actual tying is part of what I like about this knot. Lighter/thinner silk is better for its appearance as it doesn’t end up massive. Do you think this could be a Christensen knot, Matt ? It must take some time to untie it, of course -cf. the scene at the beginning of QOS, when he unties his tie very quickly-, but the result in the video seems really close to the knot of Craig in Bolivia. You mean the type of knot that’s like a half-Windsor with an extra wrap around? And the tie would only go through the last loop at the end instead of both? That’s possible. I agree. Most turnbull and asser ties are wide and thick which makes a beautiful four-in-hand not. Its easy to get the dimple too with t & a ties I find. I’m afraid it’s a (very tight) double windsor. Perhaps the collar of his shirt is hiding the bulkier part of the knot. Costume designer Louise Frogley decided to bring a “sharper” look for Bond. She believed that the previous Brioni suits were too relaxed for Craig. Peharps his knots in the film are in accordance with this decision to avoid a “relaxed” look. That’s an interesting point. You can see that the top corners of the knot are covered by the collar. It’s obviously quite thin silk as the knot is a moderate size. I still think half Windsor however. I’m not familiar with the pratt knot so couldn’t make a comment on that one. Ps . The Duke of Edinburgh wears a double Windsor and you can’t get more sartorial than the royal family. But then Charles wears tiny four in hand knot. Maybe they’re all Great knots? It may actually be a full windsor. It’s definitely not a Pratt. Do yo think it could it be a kent knot? I was watching some videos on the subject today and noticed that the kent knot (twisting the wide blade over to where the seam shows an then tying like a oriental/persian knot) ended up looking like the very same knot. The Kent knot is a very small knot. This knot is too big to be that. I watched OHMSS the other day and noticed that the tail of Lazenby’s tie was reversed in one scene, it’s possible it was a Shelby/Pratt or a Nicky knot. this is not a mystery at all. if the tie was tied seam in, then the oriental, kelvin, nicky, pratt, st. andrew, plattsburgh, grantchester, hanover and balthus are all crossed off the list. and since the base of the knot is clearly square, it’s not a christensen either. we’re looking for a symmetrical knot that’s smaller than the windsor. which means it’s not the four in hand, victoria (which, by the way is not another name for the four in hand; the victoria has an additional pass across the front than the four in hand), or the cavendish. that leaves us with only one knot remaining. the quantum of solace “mystery knot” can be no other knot but the half-windsor. Hi Matt just wondering if it matters which way round you tie the four in hand knot? Because I’ve noticed that Brosnan and Connery tie them in different ways: the straight side of the tie knot is on the right with Brosnan and the left with Connery. Is it just down to personal preference? I know this is a bit of an old thread but I agree with the other posters who say Windsor. My take on the QoS knot is that the collar gives the illusion that the knot is slimmer that it really is. Because part of the knot is obscured under each side of the collar. Imagine the same knot with a more cut away collar and it will look like a regular windsor. Like Connery in Dr No. The “drape” of the collar is important to get the QoS effect. I have shirts with the same collar. If I tie a regular windsor with the collar bones in then it looks silly because the knot underneath makes the stiffened collars jut out. However, take the bones out and the collar drapes slightly over the knot. This creates the illusion of a slimmer knot and looks exactly like the QoS knot. So in my view its all in the collar, the knot is just a normal windsor. For goodness sake: anyone who wears a Windsor knot is member of the hoi polloi/grockle/pleb community – the only good thing about the Windsor knot is that it helps the rest of us identify who are the social climbing fraudsters. That’s pretty inaccurate as I am none of those things. I used to really dislike half-Windsor knots and Windsors on guys I’d meet or on TV and it started to be something I’d immediately judge a guy on (I did have a horrendous boss who wore full Windors so I was a bit influenced) which clearly isn’t healthy. In the end I have reduced my feelings by wearing a half-Windsor at work occasionally, on the basis that if you can’t beat them (national bans being out of the question) then join them. I don’t feel as bad now and some days think it looks OK. Agreed. Didn’t really start wearing them until working at a menswear store. For certain outfits it can work pretty well. The double-Windsor just looks wrong to me, at least most of the time (perhaps I’ve watched too many Bond films?). The point about it working better with a cutaway collar is interesting so I might need to look again. I’m most determined to use the 4-in-hand because some rude people tell me that it looks school-boyish and insist the dbl windsor is the “correct” way. In short, Flemming was right. That’s just a Windsor, there’s no such thing as a double Windsor. 😉 I used to like the FIH only, but sometimes a Windsor or half-Windsor is just the thing depending on the outfit or image I want to convey. I would actually like some ties that make larger FIH knots similar to what Edward VIII used to wear, however. Maybe by “double-Windsor” they are referring to a Windsor tied with two ties at once–that would certainly be a fashion statement. I have trouble imagining how these things (knots, collars, colors, etc.) would look until I see them in real life. Back to the Future Part II seemed to think we’d be wearing two ties at once in 2015. In the movie ‘Aliens’ people in the future turn the back of the suit collar inside-out. I feel like the double-tie look would work well with this. It seems no one saw the shrunken suit trend coming.